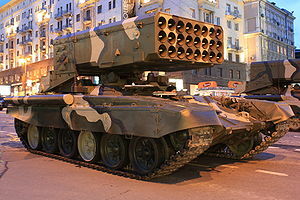 The Patriot Missiles will be hit and repealed with S 300 SAM [already installed in Syria]. Putin also threatened to deliver the more advanced S400 anti-aircraft missiles far superior to the Patriot missiles and ranked as the World’s most advanced air defense system. He added that Russia will also supply Syria with state-of –the-art 24-Barrell rocket launchers which have a range of 60 km ranked as the most developed artillery weapon of its kind.